Greetings. Before you commit to this Anderson update, allow me to discourage you. You already know everything I am about to disclose. The juicy stuff has been redacted by my lawyer. Fear not, my mom still got out of the house, she just wasn’t paid. In fact, she’d tell you she went on too many trips this year. To no one’s surprise, her favorite one was not with us. Instead, it was her “girls trip” to Italy. That doesn’t mean she didn’t miss us. 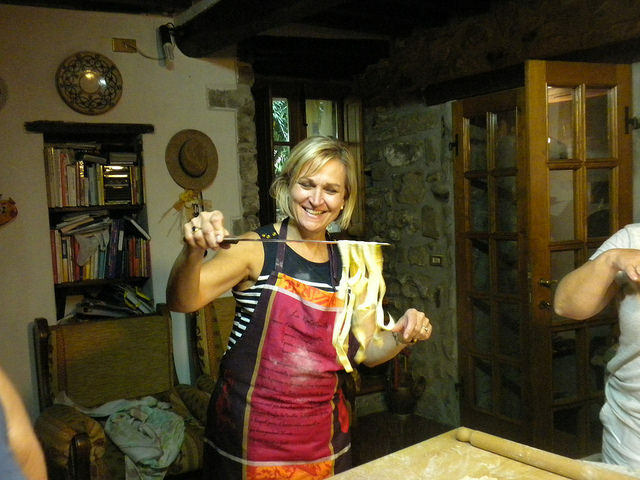 Upon being told at the airport that she could not check two bags for free and did not have access to the United Lounge, she actually uttered the phrase, “I am never traveling without your father again.” I am told the Italy trip involved wine, cooking and culture. They made pasta and maybe some friendship bracelets. Kevin later met up with my mom and his favorite Long Grove ladies from Prague for the weekend, mostly to be their personal photographer. He felt it was his civic duty as an American to save Florence from being subjected to a slew of middle-aged American women taking selfies in front of the Duomo with their iPads. Oh, Kevin is still in Prague? Why yes. We think. He is approaching the 1-year mark there, having moved in January to teach English. We think. What is he doing there? Does he like it? When is he coming back? These are all questions you will have to seek answers to yourself. While his communication is better now, it did not start out well. This initiated an email chain among the rest of us entitled “10 Things We Know About Kevin.” We pooled what limited information we had about him –short texts, bank statements and Facebook stalking– to compose a faint picture of his life there. We eventually worked all the way up to 12 Things We Know About Kevin, learning that Kevin was growing a rather unfortunate mullet and visited Transylvania. He is not the only globetrotter of the year. Morgan spent the summer in Chengdu, China to perfect her Asian peace sign in her never-ending photo opps. While Morgan is a hot commodity in the PRC, no one was as popular as Tim, who went to visit along with my parents in July. Tim lamented being in China for the 4th of July. Is there anything more contradictory than being in China on Independence Day? 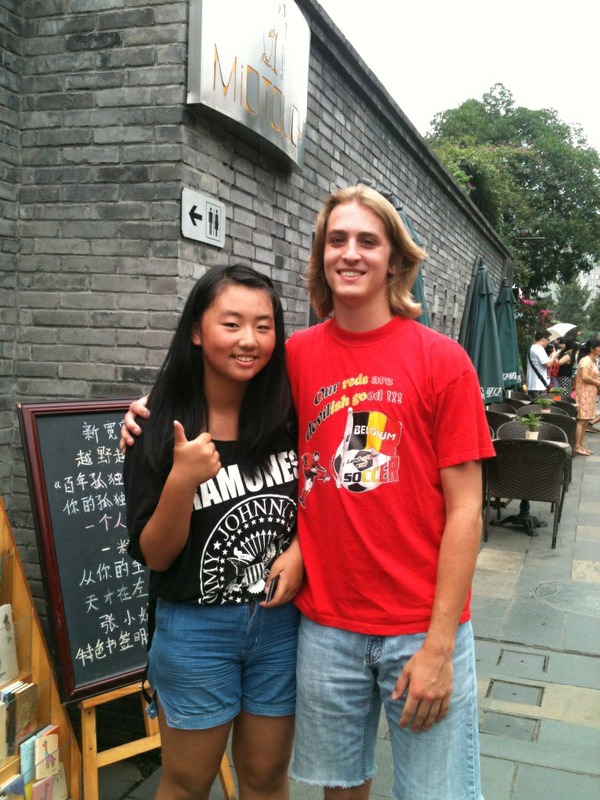 I’m pretty sure this girl with The Ramones t-shirt who asked for a picture with him in Beijng was his soul mate. While there, Morgan had to work and my dad skipped out and went to Singapore for the day on business (it would behoove you to see how far Singapore is from China on a map), leaving my mom and Tim to navigate Chengdu on their own. I received this bizzarre video in my email inbox with no subject. I’d feared they’d been kidnapped and sent to a nationalist prison camp. Was this a cry for help? Luckily, Morgan’s State Department connections came in handy and they returned safely. Mom has now been to China twice, which she says is two times too many. “I just can’t figure out why the hell Morgan keeps coming back. This place is the pits,” she said. Pits or not, Morgan does very well for herself there, something we still cannot fully grasp. When she moved into her apartment in Chengdu there was a knife casually in the bathtub. Things like this do not phase her. In May, Morgan will be the first student to graduate from South Carolina as a Chinese major. Is this prestigious? Should you be impressed? I don’t know. Given South Carolina’s collective command of English, I question the quality level of Mandarin that is taught. As for Morgan’s postgraduate plans, they are TBD. Next question. Morgan did not fly home from China. Instead, she flew to Oslo via Bangkok (the wrong direction) for our family vacation, Dad’s crown jewel, a Baltic Sea cruise. Before you write this off as an extravagant, ritzy and luxurious outing, allow me to explain the term “cruise” is used rather loosely. 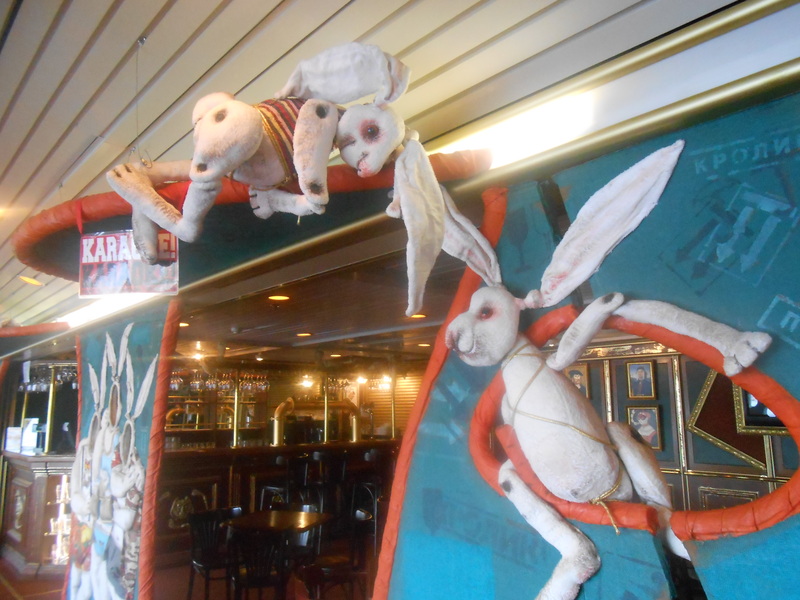 It was a Russian cruise line and we made up 6 of the 10 of the non-Russians on the entire ship. As you can see, the decor was, well, interesting. It lasted 4 days but felt like 40, and the highlight was Kevin being asked to take part in a bachelorette party in Finland. Please follow the Frequent Failer for full recaps. Just a few weeks upon our return, my parents became empty nesters, excluding Kemba. 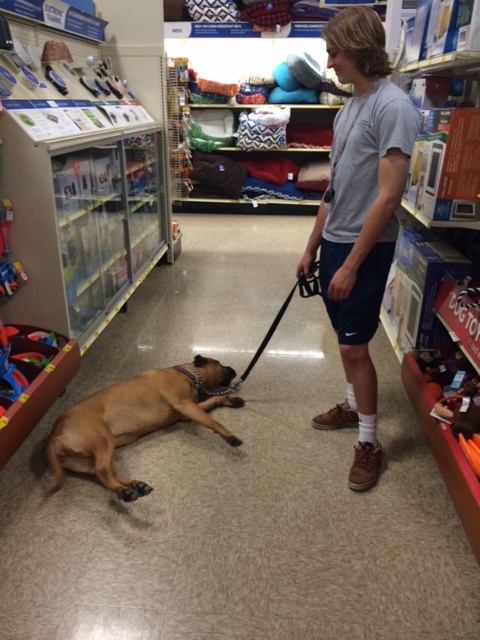 Kembykins is a bit out of shape, as evidenced by this picture of when Morgan and Tim took her shopping at PetCo. She collapsed and threw up on the floor, and the two of them had to clean it up. Since then, my mom has been walking her every day rain or shine. Timothy perhaps had the biggest year. He became an Eagle Scout and a high school graduate, and played a gig at the House of Blues in a matter of months. So far, his biggest offense is that his hair is longer than Morgan’s. He abandoned his first Gmail account, taco.bell.tim@gmail.com in favor of something slightly more professional. However, he would like to point out that his enthusiasm for Taco Bell has not diminished. In a bizarre twist of events, he attends university 10 minutes away from me. I think he is passing. We talk on the phone, I pester him about his classes and sometimes we go to Chipotle. We hope to plan a road trip to Canada soon. I am mostly his chauffeur, but am one speeding ticket away from being banned on University of Hartford’s campus. I accomplished the rare feat of being ticketed for going 30 mph (15 mph speed limit). To put it simply, I am hanging on by a thread. I lost one phone and broke another this year and accidentally ordered a replacement phone that was in Arabic. The other day I cut down a Christmas tree only to find out it was covered in poison ivy. I recently overslept for work by several hours. As for the master of the house, I’m not sure what is left to be said. We were too lazy to get anything for him for Father’s Day, so we planned an Anderson global Skype teleconference across four different time zones as a gift. Mom and Tim got bored very quickly and bounced. Do not be fooled by these somewhat smiling faces. 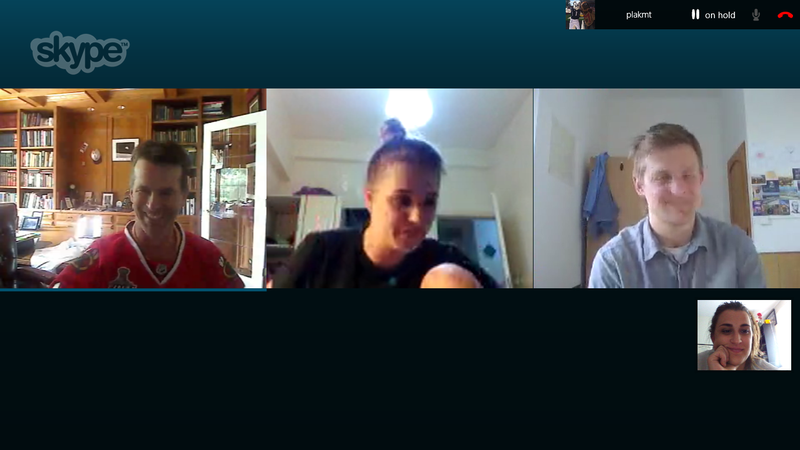 It did not go well, and ended in us hanging up abruptly and not speaking to one another for days. Barring additional cyber arguments, oversleeping and canceled flights, we will all be home for Christmas. See you then. Congratulations Amanda on writing the longest, most comprehensive, and best written season’s greetings letter I’ve ever read! Thank you for always putting a smile on my face! You should have enough blogs to bind together and form a book? ?